Composed by Blake Neely. Piano. Instructional. Instructional book. With standard notation and instructional text. 88 pages. Published by Hal Leonard (HL.220019). 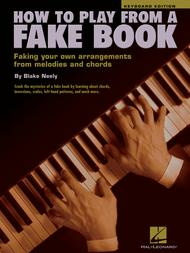 Ever wondered how to create better accompaniments for the melodies in your favorite fake books? This 'teach yourself' book introduces you to chord building, various rhythmic styles, and much more, so that you play the songs you like just the way you want them. Keyboard players with a basic understanding of notation and sight-reading will be on their way to more fun with fake books. The relaxed tone of the text and selection of fun songs keep How to Play from a Fake Book entertaining throughout - perfect for amateur musicians, or as a supplement for keyboard teachers and their students. January 07, 2019 This is NOT a finished copy...forgot to edit it? This is the worst copy of a published book I have ever seen. It has songs missing, type mismatched, so many errors it is hard to read. Is this a galley proof or a finished book??? Very disappointed this is sold. book to be too rudimentary. But for making a first step into melody/chord playing the book is a good choice.